Vegan Thanksgiving recipes can be hard to come by, but good ones are no less filling, satisfying and delicious than those for a traditional holiday meal. When made right, meat-eating family members and friends won't even suspect the best vegan recipes are completely free of animal products. Instead, they'll be too busy focusing on the wonderful tastes and textures! 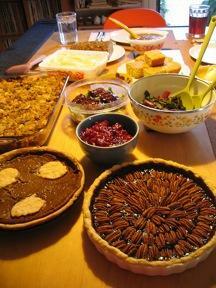 Many vegans like to modify existing holiday recipes so that they can enjoy the same foods as their families. Others like to make up their own special creations and traditions. Sometimes, a mixture of both old and new is most appealing. Pumpkin pie and stuffing are standbys at almost any Thanksgiving meal, but stuffed squash isn't quite as common and can make a standout main dish. It's easy to create your own variations on this recipe by stuffing the squash with other grains and seasonings. Each small squash makes two servings. Cut each squash in half vertically. Use an ice-cream scoop or large, sturdy spoon to scoop out and discard the seeds. Lightly rub the cut sides of the squash with olive oil, and place them on a baking sheet. Cover them with aluminum foil, and bake for about 50 minutes or until softened. Leave the oven on. Bring the wild rice and one cup of water to boil in a small pot. Turn down the heat to low and cover the pot. Cook the rice for 35 to 40 minutes. Turn off the heat and let the rice stand, covered, for an additional five minutes. While the rice is cooking, heat the olive oil in a heavy skillet. Add the chopped shallots, garlic, and walnuts. Saute for about eight minutes or until golden. Transfer the shallot mixture to a bowl, and add the cooked rice and bread crumbs. Scoop out half the flesh from each squash piece, leaving a deep cavity in the middle. Mash the removed flesh and mix it with the rice and shallots. Stuff the squashes and place them in baking dishes on aluminum foil. Bake for about 15 minutes, until well heated. This vegan Thanksgiving recipe makes enough stuffing for about six servings. In a large, heavy skillet, pour one tablespoon of olive oil. Saute the onion with the garlic, celery, sweet potato, and carrots until they are golden and softened. Combine the 1/4 c. olive oil, vegetable broth, tahini, oregano, nutritional yeast, soy sauce, and paprika. Place the bread cubes on a large baking sheet. Toast them in the oven for 15 minutes, stopping to stir once. Mix the toasted bread cubes with the sauteed onion mixture. 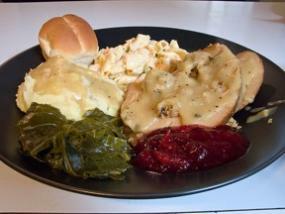 Pour the liquid sauce over the stuffing, and place the stuffing in a large baking dish. Bake the stuffing for 25 to 30 minutes or until lightly browned on top. Chill the pie thoroughly before serving. Set a double-thick layer or paper towels or cheesecloth over a colander. Spoon the pumpkin puree into the colander and let the puree drain for several hours or until it has considerably thickened. Discard the drained pumpkin juice or use it to make stock. Near the end of the draining time, roll out the chilled pie crust and press it into a pie pan. Stir brown sugar together with the cornstarch. Whisk to break up any lumps. In a large bowl, mix all of the ingredients together, including the cornstarch-sugar mixture. Pour the pumpkin mixture into the pie crust. Bake for about one hour or until the crust is browned. The pie will firm up after cooling. These recipes can help you round out your Thanksgiving feast. Test them ahead of time to see if you want to tweak the flavors according to your own tastes and perfect them for you holiday meal.